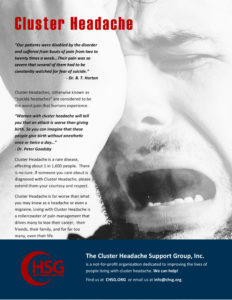 A case report suggested the efficacy of cannabis to treat cluster headache (CH) attacks. Our aims were to study the frequency of cannabis use in CH patients, and the reported effects on attacks. A total of 139 patients with CH attending two French headache centers filled out questionnaires. Cannabis use is very frequent in CH patients, but its efficacy for the treatment of the attacks is limited. Less than one third of self-reported users mention a relief of their attacks following inhalation. Cannabis should not be recommended for CH unless controlled trials with synthetic selective cannabinoids show a more convincing therapeutic benefit.